Royal Palm Beach dignitaries, press and community members, gathered today as South Florida's No. 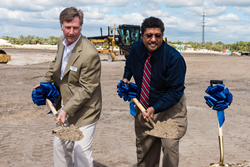 1 new homebuilder broke ground on its newest family-friendly, resort-style community. BellaSera features stunning homes with state-of-the-art designs and cutting-edge technology, in addition to vast on-site amenities. Lennar is thrilled to introduce this community of beautiful, modern homes with the latest design and cutting-edge technology features to Royal Palm Beach. Lennar, South Florida's No. 1 homebuilder, proudly broke ground today on BellaSera - its highly anticipated, new resort-style community. Uniquely nestled upon beautiful peninsulas in Royal Palm Beach and situated in the desirable heart of Palm Beach County, BellaSera is Lennar's newest gated, lakefront community of executive and estate homes. Lennar's Palm Atlantic Division President Dan Grosswald, Royal Palm Beach Mayor Fred Pinto, Vice Mayor Richard Valuntas, Royal Palm Beach Councilman Jeff Hmara and Councilwoman Selena Smith were on hand for Lennar's ceremonial groundbreaking and ribbon cutting celebrating the introduction of BellaSera. "Lennar is thrilled to introduce this community of beautiful, modern homes with the latest design and cutting-edge technology features to Royal Palm Beach," said Dan Grosswald, president of Lennar's Palm Atlantic Division. "We look forward to moving ahead on this new development that will attract a wide-range of homebuyers looking for resort-style living, while at the same time contributing to the local economy." Now selling, the exclusive BellaSera community features elegant home collections offering 1,985 to 3,597 total sq. ft. of living space, priced from the $400s. 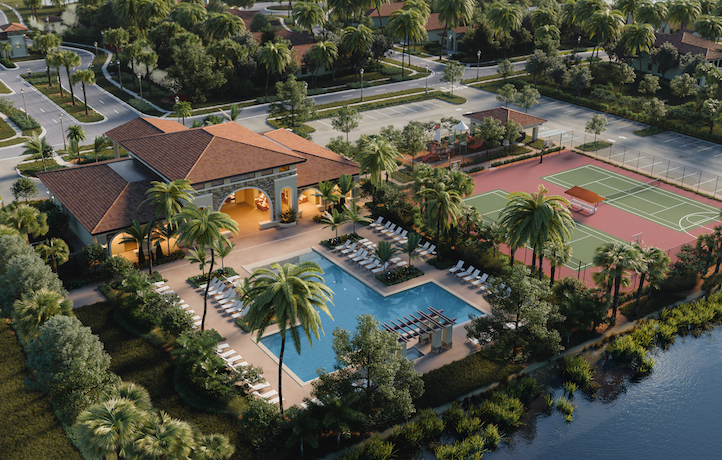 BellaSera will offer a broad array of resort-style amenities on-site, including the centerpiece Clubhouse boasting a fitness center, a swimming pool and spa, basketball and tennis courts, a tot lot and much more. BellaSera will be one of Lennar's first communities in this market to feature the company's all-new Wi-Fi CERTIFIED™ Connected Home Designs with home automation. These state-of-the-art homes keep owners connected to the most desirable tech devices, all of which are included with their new home purchase. The community will also feature Lennar's innovative NextGen - the home within a home - designs. Specifically, these homes - the only ones of their kind offered by any homebuilder in the area - provide a private living space integrated into the main home, perfect for multi-generational families. Homebuyers and realtors interested in the community are invited to visit the BellaSera Welcome Home Center located at 980 Crestwood Boulevard N, Royal Palm Beach, FL 33411. Lennar Corporation, founded in 1954, is one of the nation's largest builders of quality homes for all generations. The Company builds affordable, move-up and retirement homes primarily under the Lennar brand name. Lennar's Financial Services segment provides mortgage financing, title insurance and closing services for both buyers of the Company's homes and others. Lennar's Rialto segment is a vertically integrated asset management platform focused on investing throughout the commercial real estate capital structure. Lennar's Multifamily segment is a nationwide developer of high-quality multifamily rental properties. Previous press releases and further information about the Company may be obtained at the "Investor Relations" section of the Company's website, http://www.lennar.com.